This spacious 4 bedroom detached property is located in a quiet residential cul-de-sac in the popular village of Mesogi, a few minutes’ drive from the International School of Paphos and the centre of Paphos Town. Close by is a good range of local amenities including shops, restaurants and coffee shops, and within walking distance is a gym, supermarket and kiosk. The property has good quality finishes and being a permanent residence benefits from many extras including security alarm, aluminium shutters, full central heating, additional solar panels generating electricity for the operation of the swimming pool and double garage with internal access to the property (see full feature list below). The ground floor accommodation features a large, open plan living room including lounge, formal dining area and corner fitted bar. The addition of an Italian glass frontage wood burning fire creates a fantastic focal point as well as additional heating in the winter months. Off the dining area is a separate fully fitted kitchen/breakfast room with plenty of space for family dining and easy direct access to the outdoor leisure areas and pool terrace. A guest toilet is situated at the base of the staircase leading up to the master suite and three further bedrooms. The master is particularly spacious and benefits from an en-suite shower room, dual aspect windows and direct access to the fourth bedroom. A family size bathroom is situated off the landing and bedrooms two and three have direct balcony access. Externally, a decorative stone archway with natural wood gates leads to a private courtyard area featuring a spacious open terrace and covered outdoor dining area. There are safety gates to the private swimming pool making it ideal for those with young children or pets. Bordering the pool is a beautiful stone feature wall with low maintenance landscaped gardens above. Steps lead up from a covered sunbathing terrace to a barbecue area with fitted clay oven. An attractive stone arch off the pool area leads to a separate walled enclosure which is currently used as an external storage area. 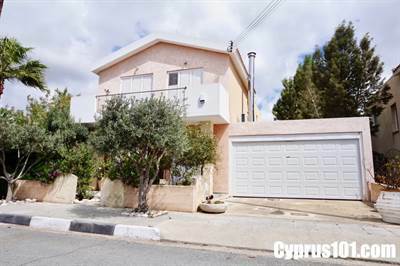 With so much to offer, this property is highly suitable as a permanent family home and benefits from it’s close proximity to both local and international schools, plus all the amenities of Paphos. Title deeds are available making it attractive to those also seeking permanent residency. ​Photos of the outdoor areas will be included shortly.